The Catholic Archdiocese of Lusaka and the Zambia Episcopal Conference regret to announce the death of His Eminence Medardo CARDINAL Joseph Mazombwe, the Archbishop Emeritus of Lusaka Archdiocese. His Eminence, Cardinal Mazombwe passed away in Lusaka’s University Teaching Hospital (UTH) on Thursday, 29 August 2013 at around 17.40 hours Zambian time. Cardinal Mazombwe was born on 24 Sep 1931 at Katete in the Eastern Province of Zambia. He was ordained a Catholic priest on 4 September 1960 and become Bishop of Chipata Diocese on 7 Feb 1971. 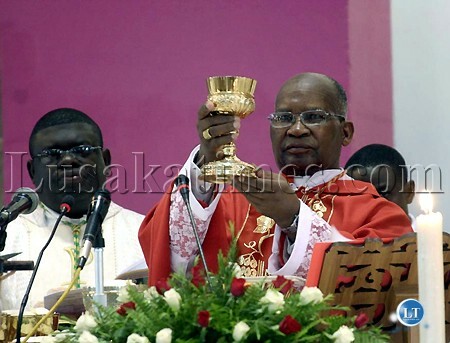 Between 1996 and 2006, he was the Archbishop of Lusaka until his retirement in 2006. On 30 November 2010 the then Holy Father, Pope Benedict XVI created the Emeritus Archbishop of Lusaka, Medardo Joseph Mazombwe, as Zambia’s first indigenous Cardinal, at a public consistory held in St. Peter’s Basilica, at the Vatican. Cardinal Mazombwe has held several senior positions in the local and regional Church, such as Zambia Episcopal President (1972 – 1975; 1988 – 1990 and 1999 – 2002); and as Chairman of the regional conferences of the Association of Member Episcopal Conferences in Eastern Africa (A.M.E.C.E.A.) (1979 – 1986). In the months leading to the year 2000, Cardinal Mazombwe, as Archbishop of Lusaka, was an ardent campaigner for the cancellation of Zambia’s international debt, in the Jubilee 2000 movement. Most visible among some of his numerous pastoral initiatives, is the sprawling Cathedral of the Child Jesus (Pope Square) in Lusaka. Cardinal Mazombwe’s optimism and courage in the face of Cancer inspired many that visited him in the last twelve months. Even as he grew weak, Cardinal Mazombwe never gave up his passion for the affairs of the Church and the nation. Other funeral details will be communicated in due course. I enever understood the Catholic church. They call people holy Father when the Bible clearly forbids such, they worship Mary and Peter, they worship graven images of so called saints. Why are almost all Bemba’s catholic? Apart from being a tribalist and favoring Bemba’s, Sata is a staunch Catholic and gives preferential treatment to those who are Catholic. Mwazonmbwe seamed to have been a good fella though and I will mourn him. I will also mourn Bishop John Maambo when his time comes. However, I will not mourn T.B Joshua who is a false prophet. I curseee him in the name of Jesus. Mhsrip,saw this on ZWD yesterday though! Thank you for the job well done and pray for us your sons and daughters. Iwe how can a dead person pray for you? Do dead people speak in your beliefs? What about you……Are you still the sinner you have always been? I remember him when as the first you group we went to camp at St. Mary’s Junior Seminary in 1981 with the likes of Gabriel Msipu, John, matandiko, Joseph (Banda),, Meckson Banda, Chaya, etc. He was very inspirational- cool and collected. He initiated projects like St. Mary’s Minor Seminary, Radio Maria Zambia, Azimai Apamtondo, just to mention a few. I new about him then I saw him in person, just seeing him as he was presiding over mass some twenty years ago in Petauke. He fail ill was rushed to the hospital, treated and came back to continue with the mass. What a person! MHSRIEP – Mzimu wao uuse ndi mtendere. WHY DID THE HOLY SEE CHOOSE THIS GREAT SON OF ZAMBIA TO BE CARDINAL ONLY WHEN HE WAS OLD AND FRAIL? IS THERE A CONSPIRACY THAT THE OFFICE OF CARDINAL OR PAPACY IS THE PRESERVE OF WHITES ONLY? A BLACK MAN IS CHOSEN ONLY WHEN HE IS FINISHED, OLD, WEAK AND FRAIL WITH ONLY A FEW DAYS TO HIS LIFE. AS FOR THE PAPACY, A BLACK MAN WILL NEVER BE. this warped thinking we ve pipo wu a older than him nd are still strong.it was just his time, even you can die young as you are so stop conspiracy insinuations. whats the name of the other indigenous bishop? It is good that you celebrated your life in truth and faith to bring lost sheep to Christ Jesus. It is a turning point for all clergymen and women to work in the lime light of the moment of truth and faith. May the good Lord receive you Joseph Mazombwe and rest in peace. Your time has come to enjoy in your father’s house just like the way you used to say “one day time will come that all of us will have to enjoy with Jesus Christ in his father’s house”. I thank you for your life, which you choose to work for God until death. RIP Cardinal after serving your Lord and Saviour in truth and humility. We thank God you were a gift to us all. Rest in Peace and join your ‘son’ Fr. Chungu in eternal joy.